Life Planning can reliably deliver the most exhilarating, pragmatic and meaningful financial planning meetings for your clients. In my presentations at the ACP Conference, I'll discuss Life Planning's five-phase EVOKE® process and how its roots in mindfulness and listening skills reveal clients' dreams of freedom and then deliver them. Through lecture and experiential exercise, we will consider the inner listening/mindfulness skills required for mastery of client conversations and the significance of great listening in successful client engagement. The webcast is free to attend but financial professionals must register in advance, as space is limited: https://attendee.gotowebinar.com/register/5035230385605836812. Book author and speaker/trainer George Kinder, founder of the Kinder Institute of Life Planning, has been named “one of the 35 most influential people in financial services,” “one of the top Icons & Innovators in the financial planning industry,” “the first of 15 transformational advisors whose vision most changed the industry” and has been inducted into the Financial Planning Magazine Hall of Fame. His expertise has been featured in The Financial Times, New Model Adviser, Forbes, Time Magazine, FP Today, The Journal of Financial Planning, InvestmentNews and The New York Times, among many others. Harvard-educated Kinder has revolutionized financial advice for more than 30 years, training over 3,000 professionals in 30 countries in the field of Life Planning, a method considered to be the gold standard for advisor-client relationship skills. In addition to his new book A Golden Civilization (pre-orders available on Amazon October 2018), he has written three books on money: The Seven Stages of Money Maturity, Lighting the Torch and Life Planning for You; and one on mindfulness – Transforming Suffering into Wisdom; as well as a book of photography and poetry – A Song for Hana. On Nov. 5 and 6, 2018, as a pre-conference option being offered the two days immediately preceding the ACP Annual Conference, Kinder will be leading his signature “Seven Stages of Money Maturity” workshop. “Advisors will learn how to improve their listening, relationship and inspirational skills. We will discuss the psychology of money and provide a model for understanding and developing client relationships as well as one’s own relationship to money,” Kinder said. Being an ACP member is not required to participate in this special two-day Kinder workshop. Furthermore, anyone participating in the Kinder workshop may also stay to attend in the 2018 ACP Annual Conference at the ACP member rate. More information is available here: https://2018.acplanners.org/content/featured-speakers. 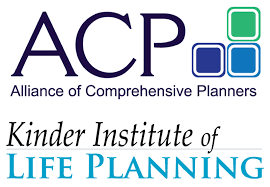 The Alliance of Comprehensive Planners (ACP) is a community of tax-focused financial planners who provide comprehensive planning strategies for their clients on a fee-only retainer basis. ACP members are required to maintain the CFP® or CPA/PFS (or equivalent) designation, complete ACP’s rigorous training program and meet some of the highest continuing education requirements in the industry. To learn more about this fiduciary network or to find a certified ACP member, visit www.ACPlanners.org.